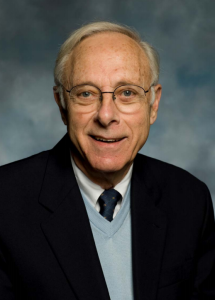 Aaron J. Shatkin was well known for his work on reoviruses beginning in the 1960s in his laboratory at the Roche Institute of Molecular Biology in Nutley, NJ and then at Rutgers University. He was among the first to appreciate that virus particles contained many different enzymes, such as RNA polymerase and poly(A) polymerase, that could be readily purified and used to study aspects of the viral replication cycle. His studies of reovirus mRNAs revealed an unusual methylated, blocked 5′-terminal structure, m-7G(5′)ppp(5′)G-MpCp-. He found that the 5′-terminal G of reovirus mRNAs made in purified virions or in infected cells was linked to the second G via a 5′-5′ chemical linkage, not the typical 5′-3′ linkage found in nucleic acids. This structure, soon to be called the cap, was subsequently found on many other viral and cellular mRNAs. His laboratory found that the cap is required for efficient translation of mRNA and also for mRNA stability. His discovery of a protein that binds the cap, now called eIF4E, lead to our understanding of how ribosomes are recruited to mRNAs to initiate protein synthesis. In recent years he became interested in the enzymatic machinery in cells that is responsible for synthesis of the cap structure, the capping enzyme. He studied the role of the capping enzyme in the nematode C. elegans and, in one of his last papers, solved the structure of the protein. I have very good memories of Aaron: in 1979 I interviewed for a postdoctoral position in his laboratory at the Roche Institute (during my seminar I also met Ann Skalka with whom I co-authored a virology textbook many years later). Aaron was the first to offer me a postdoctoral position. I recall him being extremely kind and genuinely interested in my career. When I told him I was also interested in David Baltimore’s laboratory, he quipped ‘You’ll be lucky to even talk to him’; but he had a smile on his face. I was lucky to obtain a position in the Baltimore lab, and when I called Aaron to tell him, he was extremely gracious and congratulatory. Over the years I met Aaron on many occasions; he was always friendly and cheerful and we often had long scientific conversations. When I moved to Scotch Plains, NJ in 1989 I was surprised to find that Aaron lived just around the corner, less than a mile away. I often saw him jogging by my home on Saturday mornings. Once I pointed him out to my older son: ‘that is the man who discovered the cap on mRNAs!’ My son had just studied the mRNA cap in high school biology so he knew what I meant. After that he often told his friends that the cap-discoverer lived near him in NJ. 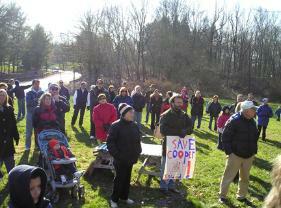 Several years ago, when our town wanted to build a home on a nearby small island of land, residents organized a rally to protest the development. It was called ‘Save Cooper Road Island‘ and Aaron and his wife Joan came to lend their support! You can see me with Aaron in photographs of the event (In the photo at left, he is to my left, wearing khaki pants, a dark jacket, and white cap; I am holding a sign, and Joan is to my right). Just over a year ago he interrupted one of his runs to come by and tell me that his wife had passed away. ‘It’s a bummer’, he said, ‘I have to do all the cooking and cleaning by myself’. I asked him when he was going to retire, and he said now that his wife had died, he would probably keep working as long as he lived. Which he did. Aaron was a terrific person and scientist. I will miss watching him jog by, telling people that my neighbor discovered the mRNA cap, and thinking about him as I drive past his home. I had planned for years to organize a dinner with him and my Ph.D. mentor, Peter Palese (Peter did a postdoctoral fellowship at the Roche Institute while Aaron was there and knew him well). I also planned to interview Aaron for TWiV. Now I can’t do either. I really should learn not to put off doing important things. I’m shocked that they cover mRNA caps in High School Biology! WOW!